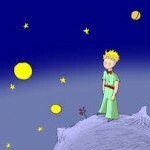 Star Child: Antoine de Saint-Exupéry. great number of little bells that knew how to laugh. 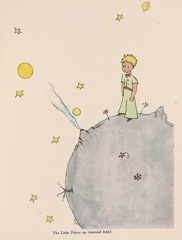 The Morgan Library and Museum features the New York story of Antoine de Saint-Exupéry, The Little Prince. 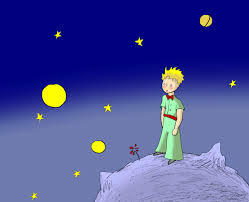 Antoine wrote The Little Prince in New York, at the height of WW II. It’s images and sounds live with us. And his message relates to us today as we plan to harness and mine asteroids and colonize space. All men have stars, but they are not the same things for different people. For some, who are travelers, the stars are guides. For others they are no more than little lights in the sky. For others, who are scholars, they are problems… But all these stars are silent. You-You alone will have stars as no one else has them… In one of the stars I shall be living. In one of them I shall be laughing. And so it will be as if all the stars will be laughing when you look at the sky at night..You, only you, will have stars that can laugh! You will always be my friend. You will want to laugh with me. And you will sometimes open your window, so, for that pleasure… It will be as if, in place of the stars, I had given you a great number of little bells that knew how to laugh. The February 2019 Institute for Exoconsciousness features the Contact and Contact issue of New Observations magazine of art and culture along with Institute programs and conferences. This annual report brings you up to date on our members, communities, and programs as well as our nonprofit’s accomplishments and hearts’ desires. Where we are and where we see ourselves advancing as a Community of the Exoconscious. Vermont Consciousness and Contact will be Continued in September. You are invited! Before the memory of our recent Vermont Consciousness and Contact fades, I want to share with you my highlights, because, you are invited to the next gathering scheduled for September. The 70-year history of such government-military studies has been primarily focused on addressing the threat to national security, which has left Experiencers as the primary authority on the nature and motives of the extraterrestrials. They have addressed many of the subsequent questions and concerns provoked by this recent Disclosure, and therefore offer a critical resource.